Police officers in the Baltimore and D.C. metropolitan area have been trying to crack down on illegal dirt bike riding for years, but have little to show for their efforts. It seems this brand of illegal riding is as popular as ever, as it’s hard to take a daytime drive around the city without encountering a group of teenagers and young adults popping dirt bike wheelies in the street. The riding has become a nuisance for motorists and residents in the area, and police have responded by citing or arresting the riders and confiscating their bikes. This has been an ongoing thorn in the side of the police, but the problem has not really risen to a critical level until recently. The heightened concern is not only due to an increased amount of injuries to pedestrians and the riders themselves, but also the astronomical rise in the number of dirk bike thefts being reported in the metro area. It seems that urban riding has become so popular that it has created a lucrative illegal market for the bikes, which can in some instances cost as much as a car. Numerous thefts have been reported in Montgomery County, Frederick County, and in Baltimore City. 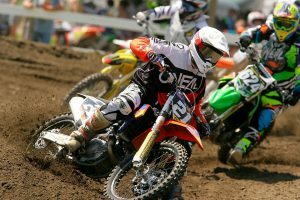 The thieves have become organized and determined, sometimes following actual dirt bike riders home from the track, or researching where they live. One professional rider in Montgomery County had two bikes stolen from his house with an estimated total value of over $25,000. In addition to becoming organized and determined, the market for bikes has caused some brazen behavior from thieves. Recently a group of young men actually broke into the Baltimore City impound, where bikes confiscated by police are stored. This group of ten young men were met by an unarmed security guard who could do little to stop the thieves other than call for backup. Six of the young men were arrested, but the other four got away with stolen property. One of the thieves allegedly flashed a handgun to the security guard as he gave chase. Outrage from the community and frustration from the police department has prompted the creation of a special police dirt bike task force to combat illegal riding in Baltimore City streets. This will undoubtedly lead to more arrests and more confiscated bikes, but as the popularity of street riding explodes it seems we are far from seeing an end to this activity. The Blog will continue to follow cases involving illegal street riding in Baltimore and the surrounding areas. We will also follow cases of dirt bike theft as well. Those arrested for stealing dirt bikes will face the charge of motor vehicle theft, which is a felony with a maximum penalty of five years in jail. These defendants could also face felony theft over $1,000 and burglary charges. Many of the defendants are actually juveniles, and based on their age they could be tried as adults. The riders often face numerous traffic offenses such as driving an uninsured vehicle, driving without a license, and driving an unregistered motor vehicle. Some traffic charges related to illegal street riding carry jail sentences, expensive fines and points, which can lead to valid licenses being suspended by the MVA. Benjamin Herbst is a Baltimore criminal defense attorney who handles motor vehicle theft and burglary cases in all state and federal courts in Maryland including juvenile criminal court. Contact Benjamin for a free consultation about your case at 410-207-2598. Dirt bikes stolen across Maryland, wbaltv.com.